A few weeks back, we had a chance to visit Grovewood Tavern for a night out on the town. Which, at this point, means we eat an early dinner and are home by 8. Grovewood is truly a neighborhood gem, as it’s literally located in the middle of a neighborhood in Euclid. No shopping strip or plazas, just houses. It’s a bit eclectic, but has the “feel” of a tavern, whatever that is. The menu is quite wide-ranging, not like your stereotypical pub food. Ah yes, the food, the only real reason I write these up. 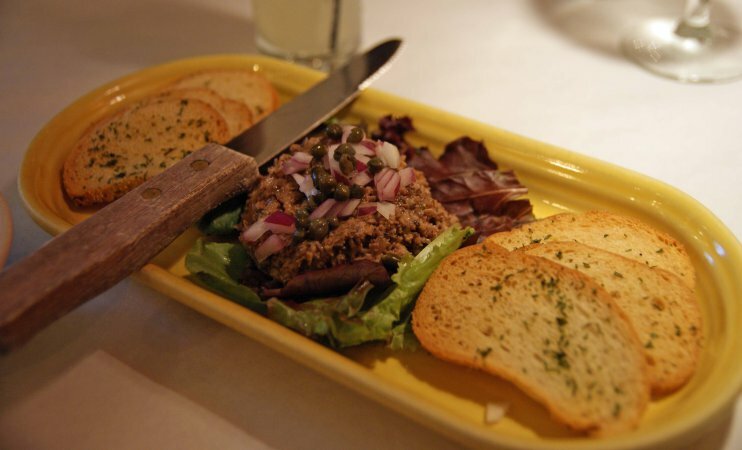 For a starter, we tried the forest mushroom pate, a blend of mushroom, walnuts, and red onions. Served with bite-sized crostini, this was a nice way to begin the meal. It was light, but had a nice earthy flavor. 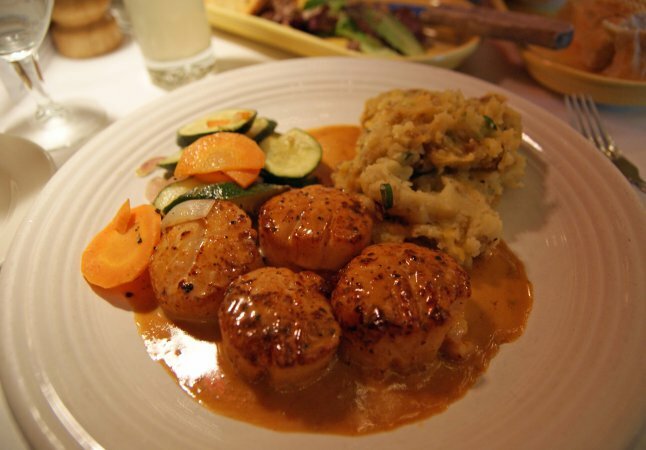 S, as she often does, tried the blackened diver scallops. The scallops were poached in an ancho honey cream, with chorizo, cheddar, and scallion whipped potatoes. These were excellent, with a hint of heat in the cream sauce, but nothing overbearing. And the potatoes, well, what do you think happens when you add sausage and cheese to mashed potatoes? Near-divinity. I partook in a tender bison pot roast. 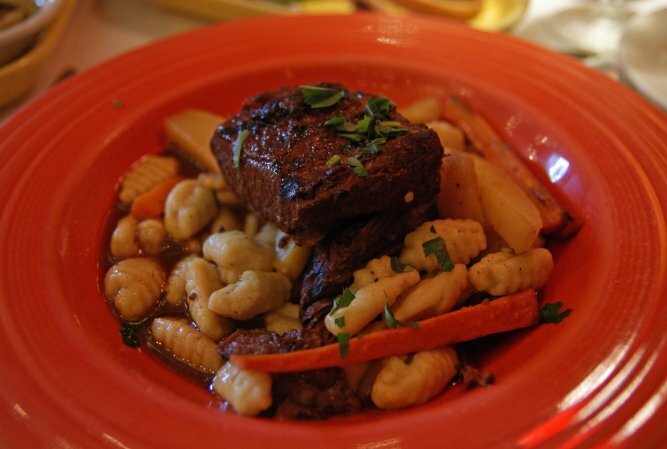 Slow-braised, and served over fresh gnocchi and root vegetables. Fell apart with merely a glance. 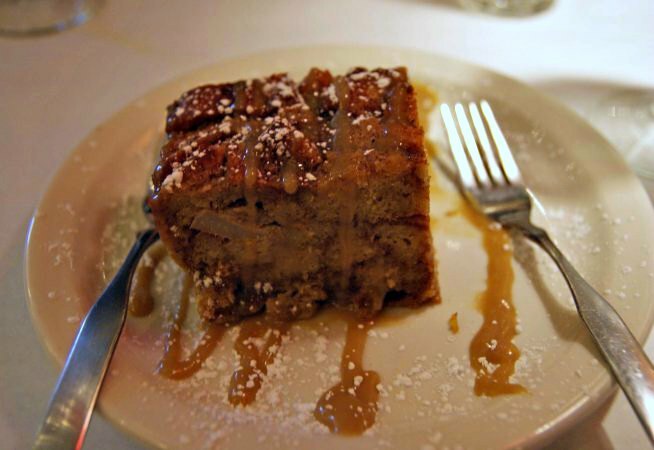 Dessert, as it somehow seems to end up being quite a bit, was a moist, flavorful caramel bread pudding. The verdict: Grovewood Tavern gets 5 1/2 stars out of seven. The food was great, service was great (probably the quickest entree delivery we’ve ever had), and prices were, for the most part, perfectly reasonable, with a few ranging toward the high side (entrees run from $17 to $29), . Very nice experience.